With the rise of the need for workers in the factories and cities, there has been a massive need for the construction of housing, for the many workers who have been transported from the rural areas of many countries. 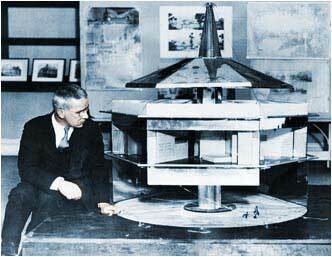 The challenge is made even harder since 1927, with the need to produce housing cheaply. 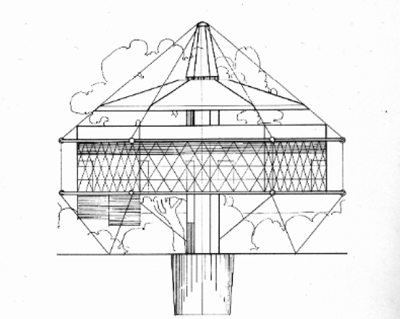 The final design ('final' as in the only one of the designs to be built full-scale) is considered an architectural revolution: it is cylindrical with a dome-shaped roof. 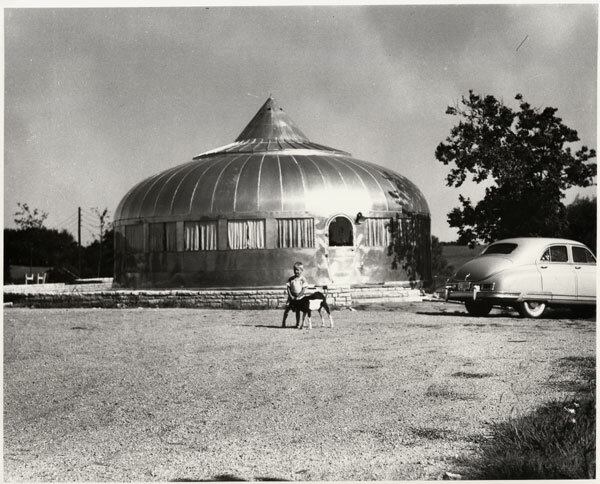 The aluminium (as used in aircraft skins) outer walls encloses 1000+/- square feet of living space and tall plexiglass windows were incorporated into the walls of much of the structure. As with its precursors, the house rests on a central support column which enclosed the essential services for the house - plumbing, ventilation and elastic trickery. Notably this design dispenses with the upper deck - a feature common to all of the preceding designs - and sits at ground level, firmly rooted by a network of rods around the outside of the structure. A rather ingenious filtration system worked via the central column - a series of screens on the walls of the house can be opened to allow air to enter, and the central column allows stale air to exit through a spiral horn-shaped outlet on the roof. This outlet is fully rotating and had a large baffle on either side that caught the wind, keeping the outlet facing away from it using the same principle as a weather vane. 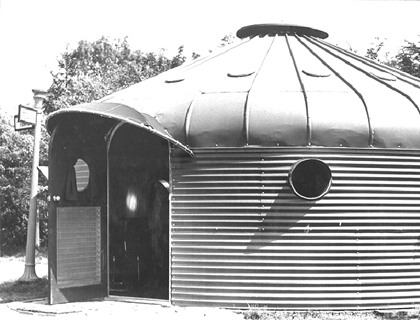 Dymaxion claims this system completely replaces the air in the house every six minutes. Inside are two bedrooms, a living room, a kitchen and one or two bathrooms. The whole floorplan is moveable - either through moveable dividing walls or having each room as a separate unit, able to move around the centre (sources don't mention which). This means that, for example, the bedrooms can be shrunk to increase the size of the living room. The ventilation system of the house also serves to keep it clean - not only does it filter the air but it keeps it moving which, coupled with the total dearth of corners in the house (the walls curved to meet the floor), means that very little dust builds up anywhere it can't easily be cleaned from. Several innovations are built into the house to make the occupant's life easier, including shelf units that revolve behind the walls of the house ("O-Volving Shelves") until the desired items are accessible and closets fitted to the back of a section of rotating wall.